Click the button above to read more about the challenge and to find information about purchasing the book. I have not been compensated. I wanted to give you an update on what’s going on so far over at Homemaker’s Challenge. The challenge focuses on being a homemaker and what that entails of course (cooking, cleaning, taking care of the children…) but also on why we do what we do. 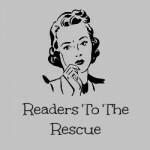 So far we’ve completed (I say “we”, but I’m not quite as caught up – more on that in a second) Days 1 – 7 of Sarah Mae’s e-book 31 Days to Clean – Having a Martha House the Mary Way. If you’re caught up on your Bible you know who Mary and Martha are, but if not here’s a quick (and probably pretty sloppy) explanation. Martha is your typical Type A housewife type. Work then fun (if you don’t get to the fun because you’re working – well that’s just the way it is – “At least someone does some work around here!”). She feels pretty annoyed that while she’s scrubbing and doing the work those around her are skipping the work and just enjoying the experience of being together. Mary is more of an “experience first” type of girl. She recognizes that the work can wait when there are experiences to be cherished and that the world isn’t going to end just because there’s a dust bunny under the couch and she’s not one to flinch when someone important stops by and the house is a mess. She’s pretty laid back about things and would rather enjoy friends and family. She realizes that a perfectly clean house might mean she misses out on something important. This annoys her sister Martha to. no. end. Each day in the challenge there are two tasks, one for Mary (examining the ourselves and coming up with ways to make your house a home) and one for Martha (cleaning a specific area of the house). Being sick this week has limited me somewhat, so I’ve only gotten through the Mary portion of the first 3 days. Out of respect for Sarah Mae’s copyright I can’t share the details of every challenge, but I wanted to spend this week giving you my thoughts on the first few days. Day 1 charges you with creating a mission statement of sorts. I am super lazy if I let my feelings run the show so I love the idea of writing out my response to why I want a clean home. I’m going to scrapbook it up (make it look pretty) and put it up in our home office so that on days when I’m really not feeling like being Martha – I’ll be reminded why I should be (at least some of the time). Confession time: I gotta tell ya though, I’m usually Martha on steroids. Oh I am so Martha. I cannot relax until the cleaning is done – to the point that I put my happiness on the back burner and neglect what gives me joy (blogging, crafting, spending time with The Hubs). Having Martha’s motivation to tend the house and Mary’s spirit of making it a haven all rolled into one seems so powerful to me. Homemakers add life and vitality to a house. We turn a wood and brick box into a place people want to be. It’s warm and inviting and encouraging. And it’s not about perfection or putting people and experiences on the back burner just so we can have a clean house. (Something I need to remind myself of often.) 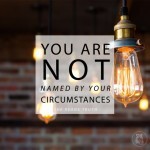 What an amazing gift we have – the power to influence our home and family in such a way! I clean and tend our home so I can live a relaxed, fun life and can freely enjoy my family, friends and life experiences daily. 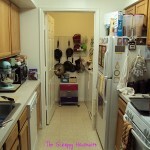 I want my home to be a haven, not just to me, but also for my husband and our friends. I want it to be a place of encouragement, refuge and relaxation for all – including myself. I want our home to be the place where we work toward our dreams and expand our horizons and write our story every day – not just when it’s perfectly clean. Why do you do what you do? Why do we as DIY/creative/home bloggers care so much about organization, decor and keeping the cost under control and the experiences documented? Leave me a comment below. I’d love to hear what you have to say. Declutter Your Home! 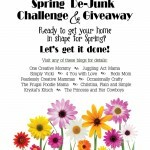 Spring De-Junk Challenge and GIVEAWAY! Great post! I am also totally a “Martha”. I have really loved the Mary challenges in this book that force me to step back and put thought into each cleaning task that I do. Can’t wait to hear about the weeks ahead from you! Have a great weekend! OH boy. Sometimes I’m too much of a Mary, and need to be more Martha. But I think I’m probably a happy medium most days. I think blogging about all this stuff really helps stay motivated and focused. Not sure, though. The other reason – community!